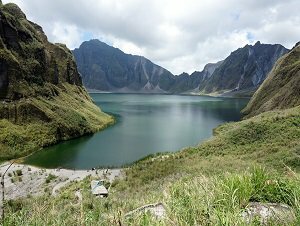 If you don't mind taking the provincial bus or maybe bringing your own vehicle to share a scenic drive with family and friends to Central Luzon's favorite adventure spot, this package is for you. 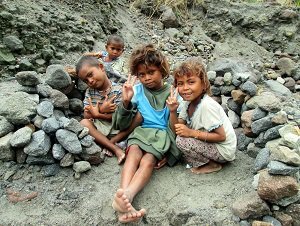 Get ready for an exciting off-road 4WD crossing through lahar canyons where some of the indigent people of the Philippines live, the Aetas. 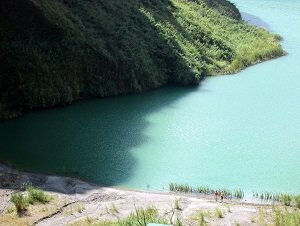 Wear your hiking shoes, as you will be traversing through streams and volcanic trails to reach the world-renowned blue-green crater lake of Mt. Pinatubo. 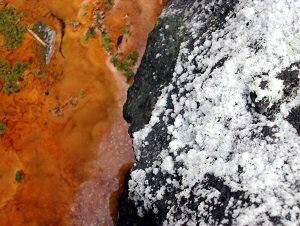 Enjoy your picnic lunch by the tranquil lakeshore and marvel how one of the world's most destructive volcanic eruptions in this century can turn into a thing of wonder and beauty. The Aetas know too well that this mountain takes but they are also aware that it gives back abundantly. They have learned to live on it with respect, humility and gratitude. Surely, that is one lesson we all city slickers can take-away with us. We currently offer the cheapest rate of the market (around Php1,600/person for big groups). 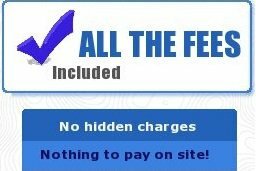 Rates depend on your group headcout and when you plan to go, please contact us now with these details and we will send you right away the quotation. With your own car: the drive from Manila takes around 3 hours of good expressways and roads. With public transportation: commuting to the base camp involves taking a public bus then a tricycle ride. Ready to hit the wild track to the mountain? Make sure that you are at the base camp before the 6AM cut-off. TRIPinas will provide a detailed road map and driving directions to reach the camp so make sure that you indicate your point of origin when you book so we can guide you accordingly. There are no shops/restaurants that are open by the time you arrive on-site, so it is best that you bring your breakfast, trail food and some packed lunch with you to prevent inconvenience. To eliminate garbage issues on camp and on the trail, we discourage you from bringing single-use water bottles and food containers. Upon arrival at the base camp, a TRIPinas coordinator will meet you, give you ample tour briefing and finalize the sign-in. There are basic toilet facilities on camp that you can use before you leave for the mountain. 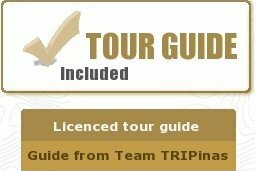 Each group of five people will have one dedicated local guide. He will be in-charge of your safety during the off-road ride and the hike. Most of the guides belong to the Aeta tribe, the indigent people of Mt. Pinatubo. You are welcome to ask them questions about their way of life in the mountain, how the eruption has affected their lives, etc. Just be aware that very few of them can speak English due to lack of schools in the area. There are no official porters available on camp so please bring only what you can carry. Your day pack, preferably waterproof, should have at least 2L of drinking water, some snacks, packed lunch, sun screen, a light-weight poncho/raincoat/wind stopper. We recommend that you wear a hat as you will be returning around noontime and the sun can get pretty intense. The ride is also very dusty due to lahar and a scarf/buff that is big enough to cover your hair, neck, nose, ears and mouth will greatly help you (see image). A pair of sports eyewear/shades will also be beneficial especially if you wear contact lenses. If you have mobility issues (e.g. an old ankle injury), feel free to bring a hiking stick with you. The one hour off-road ride is bumpy and can be uncomfortable. 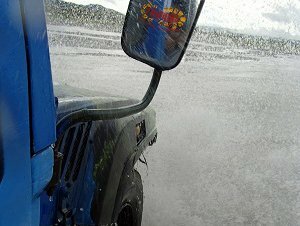 Since the vehicle will cross some streams/rivers, expect to get dirty and wet. 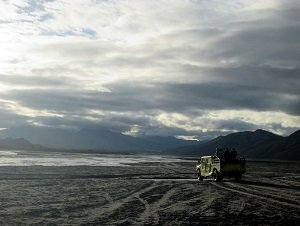 All the off-road vehicle drivers are trained in crossing the lahar canyons but due to the nature of the terrain, it is not uncommon to sometimes get stuck. Do not panic. There is always help around. The group will have one photo-stop after the river crossing so you can take your amazing shots of the sunrise. From here, you will also see the locals with their precious carabaos (aka water buffalos) crossing the lahar field with their produce. It is a sight to behold and provides an interesting glimpse on how the community has continued to courageously live on despite the destruction brought by the catastrophic eruption of this mountain looming on their backyard! After your off-road ride, your hike begins! The trail is strewn with volcanic rocks. Exercise caution when walking and crossing streams. Stay away from the lahar walls as they can easily collapse due to wind and water erosion. After about an hour or so of walking, you will reach the view deck of the lake. You can set-up your picnic mat and have your lunch here or squeeze a little snooze time and enjoy the silence and cool breeze. Be reminded that swimming in the lake is not allowed. There are toilet facilities in the area, too, for your convenience. Around noontime (or earlier depending on the weather conditions), you can start heading back to our off-road vehicle using the same trail. At the end of the hike, your driver will greet you and drive you back to the camp site. You may use the shower facilities in the area so you're fresh before you head back home.